Red And Silver Glossy Ladders Business PowerPoint Templates And PowerPoint Themes 1012-"Microsoft Powerpoint Templates and Background with red and silver glossy ladders" -Red And Silver Glossy Ladders Business PowerPoint Templates And PowerPoint Themes 1012-This PowerPoint template can be used for presentations relating to-"Red and silver glossy ladders, leadership, competition, business, ladders, stairs" Fan the fervour with our Red And Silver Glossy Ladders Business PowerPoint Templates And PowerPoint Themes 1012. The excitement will hit the ceiling. 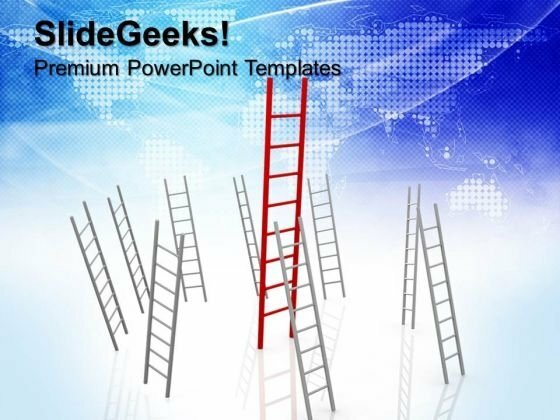 Blow out your competition with our Red And Silver Glossy Ladders Business PowerPoint Templates And PowerPoint Themes 1012. Just download, type and present.